The Marineland Maxi-Jet is a high powered, low cost powerhead that can be used for a variety of tasks. Its function as a powerhead is excellent, though it takes a small amount of work to turn this noisy powerhead into a quiet one. Using the powerhead as a water pump is pretty handy, but maximum head height is a bit short for all sump and refugiums, making it more for water changes. The price is hard to beat and when the correct model is purchased you can expect a long lifetime. The cheaper models, which come with a purple impeller rather than a white one, are much lower quality and should not be expected to live past the 6 month mark. When first setting up the Maxi-Jet you will need to decide how you will be using the powerhead. The cord is a generous 6 footer, so you can position this pump however you please. Don’t let the mass of parts scare you, you wont be using most of them. The circulation pump is what most powerhead purchasers are looking for. This mode puts out the best GPH by far, creating excellent, even water flow throughout the tank. This is done simply by placing the propeller, seen below as 6, in the mount and covering it with the circulation head, seen below again as 7. This creates the standard jet like water flow that is expected of powerheads. 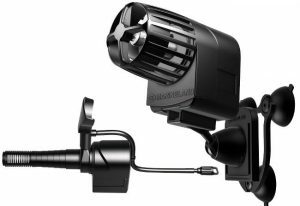 You will want to attach the motor of the powerhead to the sliding mount, seen as 9, and then attach the mount to the suction cup base shown as 4. This allows you to direct the powerheads flow wherever you like. This must be done after installing the propeller and circulation cover. It should be noted that the propeller will make a loud clattering noise on start-up, making it not suitable as a wave maker. This is by design and prevents the pump from running in reverse. Once the pump is running the right way it will stop making the noise and become much quieter. To further quiet the powerhead you can do a bit of DIYing. First cut off a tiny amount of airline tubing, basically a ring not even a tube. Next you will need to look at the circulation cover. This has a small circle at the front where the propeller will rest. Place the air line tubing circle here. Now put the pump back together, while off of course, and ensure that the tubing did not fall out. Place the Maxi-Jet back into the water, rotating to release all air bubbles, and turn it back on. If it does not start your tubing is too large. When done correctly the propeller will still clatter on start, but will only be about half as loud as before. This makes the fairly loud powerhead much more tolerable, so much so that I could sleep in the same room as the aquarium. This mode is more of a filter mode than anything else. You will be using the impeller labeled 1 and the two opening piece labeled as 2 on the diagram below. The longer tube shown on the top will be the output, which will be a bit less than a 1/3rd of the full GPH rating. On the other end of the 2nd piece you will attach the grated filter piece or under gravel filter piece shown under number 8. For the grated filter I highly suggest adding filter floss on the inside or a sponge filter on the outside. This is the main way to use the Marineland Maxi-Jet as a filter. To mount this you will only need the suction cup base, as there is little point to aiming the filter. It is still an option if you would like. This works very similar to the powerhead method, but instead you will be attaching a 1/2” tubing to the output of the powerhead. The tubing does not come with the powerhead so order this ahead of time if you plan on using it. As shown in the picture above you can either submerse the pump in water and have an overflow set up to drain water into the powerheads sump, or you can make a full system using only the powerhead. 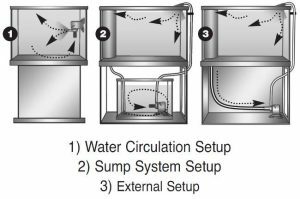 I advise the sump setup, as it is the quietest and you get a plethora of benefits from sumps. While you can get more height, the flow rate will be reduced. Both the powerhead and utility pump use the impeller rather than the propeller, making them operate much quieter. The airline tubing trick is not applicable for them. For wall mounting the Maxi-Jet you may need to use the heat trick on the suction cups, as they will often give out after a few months, dropping the powerhead. To do this heat the suction cups (I boil mine a bit) and then quickly place them on the glass. As the suction cups cool, so will the air underneath them. This makes the air contract, forming a much stronger seal between the suction cup and glass. When using the ball joint mounting device you can aim the powerhead however you like. The flow can somewhat be adjusted by using different heads on the powerhead, but there is no speed adjustment otherwise. The actual flow rate is typically above what is advertised, with the exception of the 295 model. That one is either right at or just below the listed value of 1300 GPH. Keep this in mind when you select your pump and do not over buy. If you are housing slow moving fish be sure to provide them with plenty of rest zones, consisting of low water flow. Fast swimmers will need these two, but not nearly as many. You can create these by diffusing the flow/blocking it with decorations or rock structures. When properly cared for, and with the white propeller model you can expect a full 2-4 years of life time from the Maxi-Jet. If however you purchase the Maxi-Jet and receive the cheaper, purple propeller model you will be lucky to break a single year. This is a Huge con and is something you must be extremely wary of. Consider returning the cheaper model ASAP or risk the propeller breaking fairly early on. Even with the cheaper model, Marineland does offer a full 2 year warranty on the Maxi-Jet. Simply contact their support via email or by calling them at 1-800-322-1266. Even outside the warranty period Marineland will often help their customers, along with shipping out new parts, although sometimes they will only sell them to you. Overall the Marineland Maxi-Jet is a fantastic powerhead that can be used as a pump or filter. It certainly doesn’t have all the filtration stages of a normal filter but it will keep the water much clearer while providing decent water flow. As a water pump it performs its job, but has a slightly low maximum head height. The price is amazing, and when treated right it will last much longer than other budget powerheads. This entry was posted in Equipment, Powerheads on May 14, 2018 by Joshua@themandaringarden.